I was approached by a calligrapher to make a knife specifically designed for cutting feather quills. It seems that group has been left behing by the production knifemakers, no surprise there. The customer supplied full specs, including profile length width and thickness. The grind is unusual- flat on one side, and highly convex on the other to facilitate the cuts required to create a quill pen from a feather. Interesting project. Handle is Curly Maple. I spent a lot of time searching the web for whittling knives, at first trying to find a knife to buy,then trying to learn how to make my own. In that time I saw a lot of hand made knives and was very impressed (amazed actually) with the art some makers applied to their knives. A Japanese maker of kiridashi kogatana (small woodworking knife) had a fish shaped design that inspired me to make my own fish knife. Form follows function on all the knives I make, that is they must be good, comfortable carving knives first, art is secondary. I've found that if a knife is surgically sharp, the handle size and shape do not matter much to me. By the same token if the blade is dull, the most ergonomic handle in the world will not be comfortable to use. 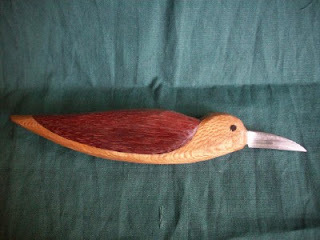 Lacewood and Purpleheart Seagull Knife (looks like a seagull to me) is the first wooden handled figural I've done, and the first knife made from an old straight razor. In the photo He's only a couple days old, the purpleheart I used for the wings gained more and better color as the days went by. I wanted the blade tp be part of the figure for this one, and I kept the shape simple. He's based on an antique folding knife I saw. I considered sanding the knife marks out, but thought they gave it a proof of being hand made. I didn't get much chance to carve with him, he's down the road, as part of a swap with a friend and fellow carver. Fishknife here is my first successful attempt to marry a carving blade to a figural knife, for me the blade and figure need to support each other. He's made from a giant mill file, just over 1/4" thick at the spine. The pattern on the spine is the original file teeth. He's about and inch wide at the front fin, and just over 7" long. Blade is thinned down to just over 1/16" at the back. He's one of my favs to use. This is my first wood handled knife, not too far out of the ordinary except for the full tang- the steel can be seen in the ball end of the knife, its the same size and shape as the handle. The wood is either bocote or ziricote I believe, it was given to me in a box of exotics. 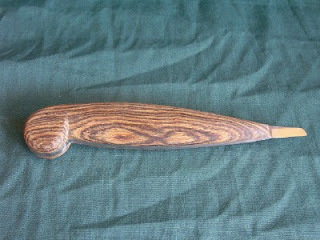 This blade shape was a custom order, a gift in exchange for the box of wood. 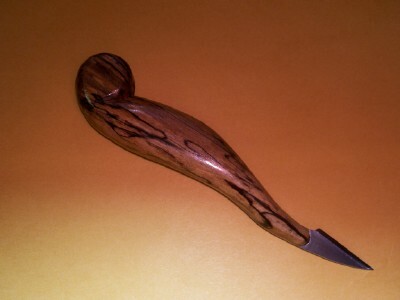 Between the dense exotic wood and the 1/8" thick full tang, this is a solid and heavy knife. The pic is of the handle in the unfinished state, the owner wanted to apply the finish himself. My second wood handled knife is a bit more organic in nature, I kept the ball end- it's sort of a signature item for me, from my leather handled knives to these. The wood is spalted poplar, and the blade is a new material too- Personna floor scraper blades, not as hard as my files but thin- only .035", just over 1/32 and a little less than half the thickness of my file knives. I wanted the handle and blade to flow together- why make something everyone else is doing? The ball end is approximately 3/4" square, the end at the blade is just under 3/8" round. Blade approx 1" long, most of my blades are in this range. The handle is finished with a mix of polyurethane, tung oil and mineral spirits, 1/3 each, multiple coats until I like the shine. The shape of the handle was inspired by the Schmoo from the Lil' Abner Sunday comic strip. The impression of the Japanese maker had on me continues, this fish knife is also spalted poplar, the blade is a floor scraper blade. This time the fish's head is the business end. You can't see it in this pic, but the handle at the blade end is curved to resemble the fish's gills. Hey I tried... 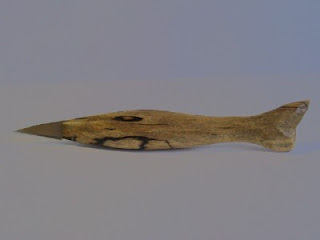 I didn't try very hard tho- the carving was done quickly and left crude and lacks detail- the blade material was new to me and I wanted a figural knife I'd enjoy using without spending a lot of time on the handle in case the blade material turned out to be a loser. 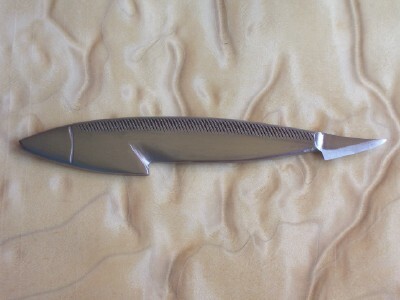 I'm happy with the knife, it cuts really well, and it the lightest one in my kit. The upswept blade works well and will probably be added to my stock knife repertoire. I'll be making more of these thin bladed knives.